The Masterwork Guild: Im still alive! Such a nice figure! It doesn't look so glossy in real life. Moradin - painting commission for my Best Man! Very excellent work. That classic style Manticore is great! Yes -it's a lovely sculpt from Bane Legions. 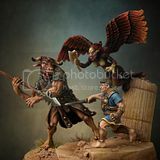 Bit expensive, but its huge and will be a great encounter for my D&D gang! It's was my first resin miniature and I found pinning it together an absolute dream! I'll be looking out for other suitable monsters from them again.